Google Assistant works inside Google Maps to provide useful information, alter your route, and even play music. Google Maps is Google's flagship map and navigation app, and Google Assistant is a virtual assistant that is built right into Android and is also available on iOS. They are both useful separately, but the integration of Google Assistant into Google Maps makes navigation easier, and safer and unlocks a ton of additional functionality. Google Assistant allows you to give voice commands in Google Maps without leaving the navigation screen. Google Assistant replaces the basic voice commands that Google Maps originally relied on. This integration means that you can fully control the Google Maps app by saying "Okay Google" followed by a command. It also means that you can access a ton of Google Assistant features and functionality without ever leaving the Google Maps app. Launch the Google Maps app and start navigation as you would normally. When you see the four dots icon appear in the corner of the Google Maps screen, that means Google Assistant is listening. Ask Google Assistant a question, or ask it to perform a function. Hint: Saying call or text, followed by the name of a person in your contacts list, will initiate a phone call or text message. Saying play, followed by a song, album, or genre of music, will play music without leaving the Google Maps app. There are also many other commands to try. The main idea behind integrating Google Assistant with Google Maps is to provide a better, and more robust, hands-free experience when using the navigation feature on compatible mobile devices. The integration not only allows users to access Google Assistant without leaving the navigation screen, but Google Assistant is also capable of performing many tasks while the Google Maps navigation screen remains in some place. In some cases, asking Google Assistant to perform a task causes the Google Maps app to shrink down to a picture in picture (PIP) thumbnail size, while the requested information or app appears to take over. Returning Google Maps to full size in these situations is a simple matter of tapping the thumbnail or asking Google Assistant to "resume navigation." What Can Google Assistant Do in Google Maps? Google Assistant can locate points of interest, like gas stations or hotels, along your route. Google Assistant can perform any function in Google Maps that would normally require the user to take their eyes off the road and tap the screen. This includes basic commands like muting voice guidance, altering the route, changing the destination, finding the estimated time of arrival, and even checking for traffic. Placing calls and sending text messages. Locating gas stations, restaurants, and other places of interest. Reporting on local weather conditions or weather conditions in other locations. Accessing the user's calendar to provide information about meetings and appointments. Google Assistant allows you to play music from within the Google Maps app. One of the most useful features that Google Assistant integration brings to Google Maps is the ability to play, and control, music during navigation. This allows drivers to request a genre, song, album, or artist, without exiting Google Maps. Launch Google Maps and start navigation as normal. Say Okay Google to activate Google Assistant. Say play followed by a genre of music, a song, an album, or an artist. Hint: Try saying play some jazz to automatically generate a jazz playlist. The Google Music app will launch with Google Maps navigation reduced to picture-in-picture thumbnail format. Tap the thumbnail or say Okay Google followed by resume navigation. The music will continue to play in the background, and navigation will resume full screen. Say Okay Google, followed by a command like pause music or mute music, to control the music without leaving Google Maps. Google Assistant can show you alternate routes, show a route overview, give you a traffic or weather report, or even send text messages and make phone calls, all from within Google Maps. Google Assistant integration with Google Maps allows you to use voice commands to create a route and alter it along the way. This replaces and improves upon the basic voice commands that the Google Maps app was always capable of accepting. Mute voice guidance - mutes turn-by-turn voice assistance. Unmute voice guidance - resumes turn-by-turn voice assistance. Show traffic - reveals any traffic problems on your route. Show satellite - replaces the basic map view with a satellite image. Navigate (destination) - generates a route to whatever destination you request. Hint: Try navigate home to get directions to your house, or say the name of a business. This command also works outside of Google Maps, in which case it launches Google Maps and creates a route. Show route overview - zooms out the route map so that you can see the entire thing. Show alternate routes - provides alternate ways to get to your destination. What's my estimated time of arrival (ETA)? - provides an estimated time when you will arrive at your destination. Avoid (tolls/highways/ferries) - alter your route to avoid toll roads, highways, or ferries. Enable (tolls/highways/ferries) - alter your route to allow toll roads, highways, or ferries. In addition to basic navigation commands, Google Assistant also responds to a wide variety of other commands within Google Maps. In most cases, it is capable of answering questions and performing associated tasks while navigation remains full screen. Call (name) - places a call to someone in your contacts list. Send a text to (name) - starts a text message to someone in your contacts list. What's the weather like? - provides a brief summary of the local weather. How's the weather in (location) - provides a brief summary of the weather in another location. Play (music) - plays a genre, artist, album, or song of your choice. What's the closest (point of interest) - provides the closest location that fits your request, i.e. "What's the closest hotel" will provide you with the hotel that is closest to you. When's my next meeting? - accesses your calendar and provides the time of your next scheduled meeting. Why Integrate Google Assistant with Google Maps When Android Auto Already Exists? Google Assistant brings many of Android Auto's features right into its flagship maps app. Google Assistant integration with Google Maps duplicates some of the functionality of Android Auto, but they are both useful to different people in different situations. Android Auto is a stripped down user interface that is designed to be safer to use in cars. It has bigger text, bigger buttons, and comes with integrated voice controls. It can also be directly integrated with cars and trucks that have built-in Android Auto support. Google Maps, on the other hand, is designed for more general use. It can be used for navigating in a car, but it is also useful for navigating on foot, by bus, and other means of transportation. While Google Maps can be useful whether or not you are actually driving a car, Android Auto is designed from the ground up for use in cars. Android Auto is good for longer trips, and it's especially useful for people whose cars support Android Auto integration. Google Maps with Google Assistant is better for people who are in and out of their cars a lot, not driving at all, or simply prefer not to launch a separate app just to use their phone on the road. Google Maps is also available on non-Android platforms, while Android Auto only works on Android devices. 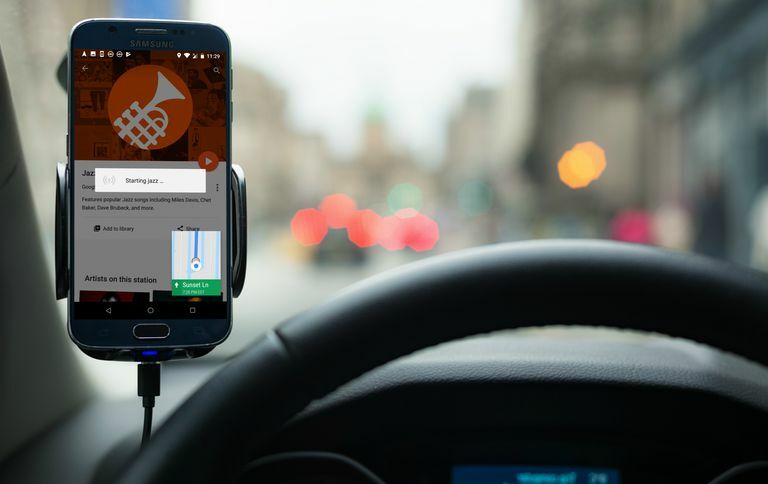 Can You Use the Waze Navigation and Traffic App on Android Auto?